Go backstage with top model Lisalla Montenegro as she shoots her first campaign for Maybelline New York. The 21 year old Brazilian beauty signed with the cosmetics brand in April, joining fellow glamazon spokesmodels Christy Turlington, Erin Wasson, and Julia Stegner. Now here is your chance to meet her and see her in action! Maybelline is a makeup brand sold worldwide and owned by L'Oréal based in Paris, France. Their motto is "Maybe she's born with it. Maybe it's Maybelline". The Maybelline Company was created by New York chemist T.L. Williams in 1915. Williams, then in his early 20s, noticed his younger sister applying a mixture of Vaseline and coal dust to her eyelashes to give them a darker, fuller look. He adapted it in his small laboratory and produced a product sold locally called Lash-Brow-Ine. The product was a local hit, but the awkward name held it back. His sister, who inspired the product, was named Maybel. So T.L. Williams renamed it Maybelline, a combination of Maybel and Vaseline. It is under this name that Maybelline has achieved its now legendary status in the field of cosmetics. In 1917 the company produced Maybelline Cake Mascara, "the first modern eye cosmetic for everyday use" and Ultra Lash in the 1960's. Maybelline received a boost when the company hired Wonder Woman star Lynda Carter as the company's beauty fashion coordinator. Lynda Carter also appeared in several of its television and print advertisements. Christy Turlington, Josie Maran, Adriana Lima, Miranda Kerr, Sarah Michelle Gellar, Melina Kanakaredes, Zhang Ziyi, Siti Nurhaliza, Fasha Sandha, Sheetal Mallar, Julia Stegner, Jessica White, Erin Wasson, Kemp Muhl, Emily DiDonato, Kristin Davis, and now Brazilian beauty Lisalla Montenegro have all endorsed Maybelline products. In 1991, the company adopted its current advertising slogan: "Maybe She's Born With It. Maybe It's Maybelline". The company was acquired by L'Oréal in 1996. 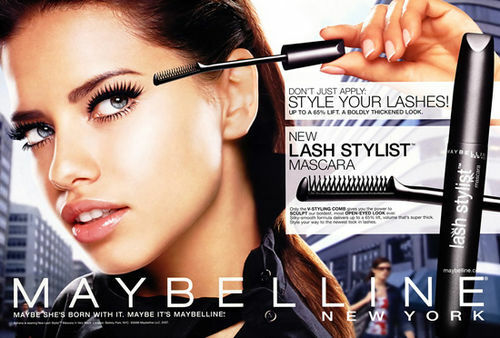 Acquiring Maybelline gave Paris based L'Oreal access to mass markets in cosmetics throughout the world.